Published: Jan. 20, 2019 at 05:21 p.m.
Los Angeles Rams quarterback Jared Goff silences the Superdome with TD toss to tight end Tyler Higbee. Published: Nov. 11, 2018 at 06:49 p.m. Published: Sept. 16, 2018 at 06:51 p.m.
Los Angeles Rams quarterback Jared Goff finds his open tight end Tyler Higbee for a 3-yard touchdown. 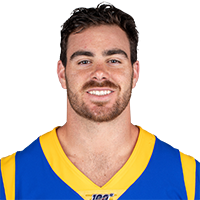 Published: Jan. 6, 2018 at 11:33 p.m.
Los Angeles Rams tight end Tyler Higbee can't hang on to a would-be TD in the back of the end zone.